This type of facility has often been utilized in the dairy industry but is somewhat new when it comes to beef cattle. The barn was constructed with the help of a grant through the On-Farm Water Management Program, which is funded by the Kentucky Agricultural Development Board in cooperation with the Kentucky Water Resources Board. David Appelman said the grant focuses on water management, water quality and preventing pollution with the hope of keeping pastures from being damaged over winter feeding. Part of the grant included sharing with other producers what has been learned through the project and to convey the opportunities provided by the structure. Appelman, who also serves as the University of Kentucky College of Agriculture, Food and Environment extension agent in Bracken County, recently hosted a field day on his farm to do just that. Throughout the day, he showed the facility to attendees and explained the function and benefit of such a structure. The muddy conditions and plentiful rains experienced through the last few months proved to be a perfect time to try out such a facility. 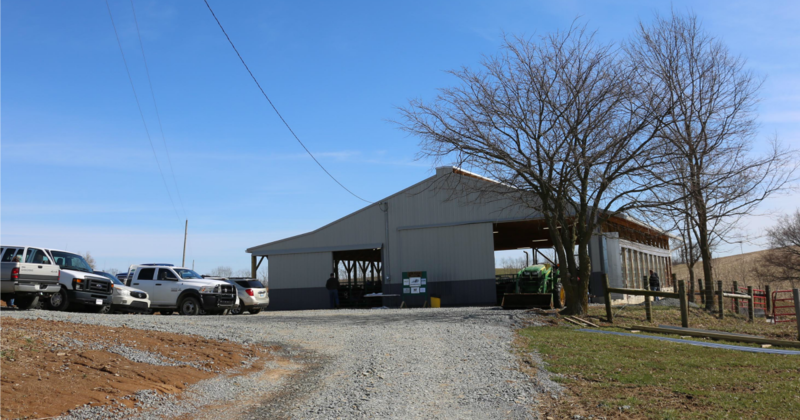 Steve Coleman, chair of the Kentucky Farm Bureau Water Management Working Group (WMWG) said projects such as this pack barn are a direct result of the work and dedication the WMWG is doing for better water resource management in Kentucky. Coleman added that one of the most amazing things to him, having chaired the WMWG since its inception, is to see the diversity, and complexity of issues that come before the group and the expertise by which these issues are addressed by members who are a part of the work group. This pack barn, and the benefits it provides, on a number of levels, is certainly indicative of some of the diversity Coleman spoke of, in that it is equipped to capture, store, and use water run-off from the structure’s roof for watering livestock or other uses. A 15,000-gallon cistern to store the water run-off will be added later. Coleman said cow comfort is critical to producers, and this barn certainly has advantages for that, as well as for the producers. But the best-practices approach to water resource management will also prove beneficial in so many ways. In addition to an ability to eventually capture water from this structure, the saw dust used as the bedding material captures any waste coming from the animals and could be reused in a variety of ways including composting. “The use of this barn just creates a pleasant situation. The cattle are happy, and when it comes to working with them every day, in a facility like this, it tends to make the cattle calmer,” said Appelman. He added that producers who are interested in building a barn such as the one he has used, can do so in a number of ways to accommodate herd size and expense including utilizing or adding to existing structures on their farm.